Bring back the taste of your childhood! Snack, Munch, Dunk! Make S'mores, desserts and pie crust. 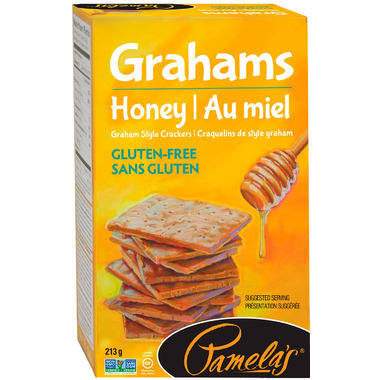 You can do it all and more with Pamela's Gluten-Free Honey Graham-Style Crackers. 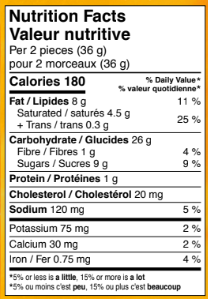 Ingredients: flour blend (brown rice flour, white rice flour, tapioca starch, sweet rice flour, xanthan gum), organic non-GMO butter (salted), brown cane sugar, sorghum flour, gluten-free oat bran, molasses, organic non-GMO honey, gluten free flavours, grainless & aluminum-free baking powder (sodium acid pyrophosphate, potato starch, sodium bicarbonate), baking soda, cinnamon, sea salt. May contain traces of nuts.